This is a fun and interesting game for bridal shower that also requires some general knowledge. Your guests would have to know an idea about other languages for playing this game. 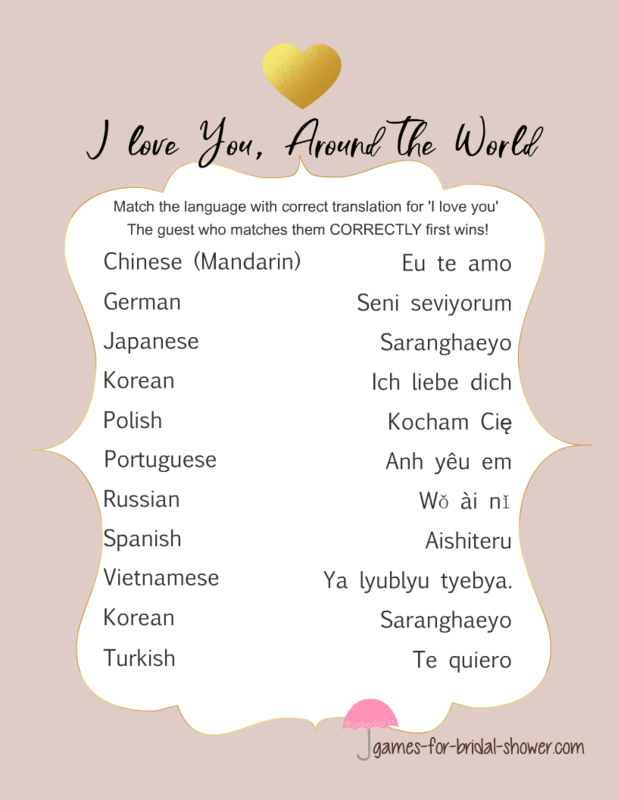 How to Play: Distribute the I love you game cards that you have already printed, among your guests along with a pen. Ask them to match the language, with how they say 'I love you' in that language with in 5 minutes. The guest who will match all the languages correctly will be the winner. Here is the answer sheet for this game so you can check if guests have matched it right. This is a cute free printable image for 'I love you' game in lilac color. To save this image just click on the image shared above and then right click and save the bigger image. Your guests will love to say 'I love you' in all these languages. This is another color combination for this game card. It is decorated with beautiful graphic of a woman blowing hearts in the air. Your guests will enjoy playing this game and will also appreciate the graphics. This is another version of this game in pink color. Let's see how quickly can your guests solve this game. You can print this pink game card if it matches your bridal shower party theme.